New “sportsmens” group enters wolf fray, but what is their real agenda? Mitt and Don up in a tree (stand), . . .
A huge, two-page centerfold ad in today’s Bozeman Chronicle by Big Game Forever (biggameforever.org) urges readers to sign a petition to demand predator management and support for H.R. 509 and S. 249, American Big Game and Livestock Protection Act, which would exempt gray wolves from the ESA of 1973. Big Game Forever seems to be mostly the brainchild of Don Peay of Utah who founded Sportsmen for Fish and Wildlife, a group that grew rapidly for a while in the West. SFW generally talked about game, not fish. Its critics said it was really “Sportsmen for a couple kinds of wildlife.” This was said to mean deer, elk and maybe moose. Peay proved himself to be an excellent entrepreneur at creating interest groups by employing the right combination of incentives to draw people to his organization. He was good at raising money and finding enemies to worry hunters. He was also good at getting preferments for his group and its supporters from several state fish and game agencies. Recently Peay has become friendly toward those who are not supporters of public wildlife or public lands. Peay recently got a lot of attention when he rejected the North American Hunting Model as Socialism. He seems to be moving toward the views of uberrich hunters and those who hunt behind tall fences, which many do not consider hunting at all. It is hard to say what the goal of his new group is. Right now it is emphasizing anti-wolf, but that field is crowded. This might be an experiment, but he also might have struck the mother lode, one or more of the top tenth of one percent of the ultra-millionaires and billionaires with an agenda for privatization and money enough to maybe buy some laws overturning American hunting, fishing, and outdoor traditions that have sustained Americans for generations. Is Peay speaking for the average person or does he want to recreate the King’s Forest? In today’s world, of course, it would be the Billionaire’s Forests. Perhaps this will be another paper organization to help Romney instead? If it brings in sportsmen, the reward could be a high position in a Romney Administration. It could be both. 42 Responses to New “sportsmens” group enters wolf fray, but what is their real agenda? The same two-page centerfold ad in today’s Bozeman Chronicle by Big Game Forever was in the Billings Gazette today, too. I wonder if it was in the Missoulian, the Butte Standard and the Great Falls Tribune, also. Well then we do know they have a pile of money. Newspapers ads like this are pricey and they will not make it back in $10 memberships. I have written here before about Big Game Forever. They are extremely anti wolf, and anti predator. Their lawyer/ director is Ryan Benson. Its bad news this push to sign a petition to demand predator management and support for H.R. 509 and S. 249, American Big Game and Livestock Protection Act. Big Game Forever went to work quickly after the Tester rider was passed in the spending bill. He and their lobbyists in the midwest met with senators to push hunting of wolves and to push for their delisting. They are organized, have a lot of money and are dangerous. Ryan Benson is one of those people with no conscience. Smart but morally corrupt. Much as I am opposed to some of Obama’s policies and KS I shake in fear thinking of a Romney presidency. Big Game Forever is corrupt. Do you believe their goal is privatization of wildlife and elimination of public lands? I’ve had some correspondence with Ryan Benson who has rightly written, “ah my stalker”. I’ve gotten quite angry and made some appropriate inappropriate e- mails to him. I started getting their BS propaganda e mail fliers some two years ago. Somehow I was put on a mailing list. After asking to be removed and having that request ignored, I started following what they were doing. Better to know your enemy thinking. It seems that BGF have a great deal of money and they spend an inordinate amount of time creating, politicizing and polarizing the “wolf” issue. I saw some correspondence that was sent between some members accidentally. It was posted by a lobbyist and described their actions to get the midwest senators involved in delisting and then to push for aggressive hunts. It was amazing how quickly the 5 yr wait period was dropped by MInnesota, who aggressive WS hunt is and how quickly the delisting went. I have no doubt BGF was influential in the mid west wolf policies we see now. Mr. Benson writes well, spins good lies and their strategies have been successful in influencing politicians to create anti predator policies. Its a mistake to ignore these people. They are some of the worst. I often think that the environmental groups need to hire some of the anti lobbyists to use and employ their strategies to protect wildlife. I wouldn’t call them new. They been around for a while Ralph. Not as long as some other groups. Don Peay, Ryan Benson, etc have been taking the credit for wolves getting delisted. I know there are some hunters who don’t like Peay or big game forever. Don Peay’s group sportsmen for fish and wildlife supported a proposal that would let trappers check their traps once every 7 days for coyotes. Thank god this proposal failed, but it really shows you what kind of group sportsmen for fish and wildlife really are. Sportsmen for Fish and Wildlife has been around; but Big Game Forever is a group I have heard little about. It is hard to see the separation between the two. A Google search doesn’t bring up much about them except news releases and You Tube vidoes which could have been the work of one person — perhaps their only employee until recently. Don Peay’s rant against game as a public resource gets a lot of attention. Ralph, say if hr 509 or s 249 did pass and gray wolves were exempt from being on the esa and they were brought down below the 150 number in either Idaho or Montana, what would happen? Exempting an animal from the esa seems pretty radical. I think the donations and membership to Defenders, Wild Earth Guardians and a bunch of other national and regional wolf advocacy groups just went up, or is about to. The gloves are off. Round 5 or is it 6, I think. Ding! I guess at some point, rural sportsmen are going to have to ask themselves how far down the rabbit-hole they are willing to follow radical republicans. I’ve seen some criticism of Peay lately from corners you wouldn’t expect, but it remains to be seen whether resistance to what he represents will continue to mount. Saw that big double truck ad in the Billings Gazette yesterday and just shook my head. Nearly all the statements given as a “fact” or ‘truth” are a lie, disinformation , or a shaded truth , as is to be expected from these sorts of advocacy sources. The veracity of the remaining assertions has yet to be determined.If you see as I have that the salient points in the BGF ad are debunkable, wait till you cruise thru their website propaganda . It gets worse. Too early in the day to fire up and go point-for-point on all that , though. I’m just ballparking here, but the cost of a double truck ad in the Billings Gazette alone (before discounts or group buy contract with several Lee Enterprises newspapers in the region) can be guesstimated at north of $ 8000, computed as $ 40 per column inch for 126 column inches per page times two , and lightly fudged ( 20 percent ). And how many of those ads showed up yesterday in Montana ? Unfortunately , the reasonable and educated wildlife conservationists cannot afford to ignore this rabble. They have too much money , have no morals, and are too well connected. If we are looking at the same website, I do not see any link to, or partnership with, Rocky Mountain Elk Foundation. Rather the emblem I see is for an Arizona group, called “Arizona Elk Society.” Am I wrong on this? Having made this distinction, who knows what RMEF will do? They have been somewhat unpredictable, but leaning toward these guys in the last four years or so (coincident with the hiring of its new President and CEO, David Allen, who once hailed from WY, prior to his career as a PR guy for Pro Rodeo and the late NASCAR driver, Dale Earhardt). I hope they stay on the sidelines, backing no more than what is the current law – the Congressional rider. Frankly, it would be pure speculation whether the organization (RMEF) or many of its members would support a blanket exclusion of wolves from the ESA as is suggested by Cody’s comment. Arizona Elk Society is a disaffected group that split from RMEF because RMEF was not rabid enough to suit them and this was years ago long before the wolf issue became the focus. They are not connected in any way. We need to avoid that kind of mistaken identification. I agree with most of this however if your plan is to illustrate support for an initiative, or attempt to gain an audience with a congressional member then showing a substantial number of signatures on a petition can help you to get that audience. Most Senators will take time for constituent meetings that can also include asking for sponsorship on legislative initiatives or to present evidence and information on a position for or against an upcoming vote. Members of the wolf-watchers did this in opposition to the Lummis rider by meeting with Jack Ryan. Not sure if they used petitions but I have been corresponding with one of Kerry’s aides back here in MA. The volunteers I am working with have been creating a data base that houses “pro wolf” petitions that have been circulating this last few years to illustrate the support that people show for wolves. There are hundreds of thousands of signatures on many varied petitons. I’m hoping it will leave an impression. I can tell you that Republican’s anti-wolf legislation, supported by special interests and anti-wolf lies, has been the major reason I’m no longer a Republican. The radical fringe elements and people like Ted Nugent are quite frightening. I’m working to convince groups like Defenders to engage in a boycott of Wyoming, Idaho, and Montana products and tourism for their anti-wolf policies. I was never a member of the party, but I used to lean strongly Republican. I’m much less friendly to them nowadays. Not that I would vote Democrat; most of them are pro-choice, and I can’t stomach the slaughter of pre-born humans any more than the slaughter of wolves. Sadly, this combination of views leaves me with practically no options. I don’t even know of a third-party candidate that I could actually agree with. I just wanted to chime in to say that this ad also ran in the Livingston Enterprise. So it seems that they are hitting the smaller regional papers as well. Well. It looks like they came into a lot of money . . . maybe some like the Koch Brothers. Today is the deadline for comments on Montana’s wolf hunt, but an ad run this late would seem to have little effect. So what is the purpose? This came by email today. It includes a petition. It is from the Montana Sportsmen Alliance which tries to counter Big Game Forever/Sportsmen for Fish and Wildlife. As most of you know, a shadowy group has started to infiltrate Montana. Known as Sportsmen for Fish and Wildlife/Big Game Forever. In Utah, these wildlife profiteers gain their revenue through auctioning off prized big game permits and being able to keep a large majority of the profits. They have been able to get the legislature to authorize the issuance of these tags to organizations such as their’s and to allow the organizations to keep up to 70% of the proceeds. This welfare has made SFW/BGF a political powerhouse in several states. However, their record for standing up for the average hunter and angler is weak. Their leader, Don Peay, has recently called the North American Model Socialism. Their hand picked director in Alaska recently resigned in disgrace after pleading guilty to over 10 wildlife violations. In Montana, Big Game Forever and Sportsmen for Fish and Wildlife tried desperately to kill the Simpson/Tester wolf delisting rider. NRA issued a press release stating “Congressional offices and members of the media should exercise caution in accepting as fact, or repeating, any claims made by Sportsmen for Fish and Wildlife, Big Game Forever or any person claiming to represent them. Due to the blatant misrepresentation contained in the press release circulated by these two groups, any claims they make in the future should be thoroughly investigated and independently confirmed.” Their motive seems to revolve around fund raising and fear mongering on the wolf issue. There is an attempt in Utah to hold these groups who receive these auction tags accountable for their actions and limit the amount of the proceeds they get to keep from the sale of these tags. Please sign the petition below and help restore the public in public wildlife. Absolutely anti-wildlife and public lands, well for enjoyment and private use by the majority of us. Democrats have done a poor job of playing the Overton Window. However, the GOP has been so successful in pushing to the right that the demographic trajectory makes them nationally irrelevant in twenty years. We see more and more of these inane (and quite frankly embarrassing) “sportsmen” groups popping up because stupid needs representation, too. Some of us might say it doesn’t, which is why this country is in the mess it is in, and also why the next President just might be an R (as a spokesman of the uber-rich, who will convince a bunch of stupid [and likely uneducated poor from the South and parts of the West who don’t know better] that a free market system, lacking regulation in any form, will make things better all. How’s that Wall St., strategy working for ya so far? At one time investing in Wall Street was investing in America. Don’t know what it is now, but it seems with hedge funds, Wall Street is anything but a safe place for the majority of people to put their money. Our elected officials don’t help the situation either as they seem to look upon themselves as leaders, rather than representatives of the people that elected them, other than perhaps the moneyed interests that for all practical purposes have purchased the “representation”. JPMorgan (acquired Chase Bank); Wells Fargo (acquired Wachovia, is now in investment banking and securites and acquired what remained of Washington Mutual the largest bank failure in US history); Bank of America (acquired Merrill Lynch securities trading); and behemouth Citigroup (Citicorp and Travelers insurance, Aetna insurance, global wealth management). There were alot more; these are just the biggies I remember off the top of my head. All of these a—oles in executive positions or on their boards (and there are lots that are on each other’s boards), and a few more in elected government, created the mess we are now in. They have served in important positions on the Federal Reserve Bank (Fed and its regional banks), and most importantly have a revolving door to government. It has just been revealed this past week that Bush Admin,former Secretary of Treasury Paulson met with some members of Congress in 2008 (important R’s and D’s alike – Pelosi among them) who sold their personal positions in equities just days prior to the formal announcement of the 2008 financial melt-down (now if that isn’t trading on insider information I don’t know what is, even though it is apparently legal because it is not covered by any of the SEC laws). Of course, Paulson, was the former head of Goldman Sachs, the premiere investment banking firm which periodically gets caught for doing bad things, and from which so many cabinet level financial types are recruited. If you bank or do business with any of the above companies you are a part of the problem. Switch to a local credit union, make a stand and take your country back. Did I just say something that smacks of socialism (in favor of the NA wildlife model) and against what might become the King’s forest, and gadfly activist Don Peay? Shame on me. Jamie Dimon was actually a leading candidate for Treasury Secretary before Geithner was appointed. The Frank-Dodd Act (I can’t believe an act relating to regulation of Wall-Street was named after these two clowns) appropriately put limits on proprietary trading by commercial banks, as well as creating more oversight of derivatives. I believe it might have strengthened capital requirements, but I don’t quite recall. That being said, Frank-Dodd was mostly a wasted opportunity to re-split commercial and investment banking and carve up the biggest remaining banks until they were no longer “too big to fail”. Almost none of those Wall Street executives were worth what they were paid. The top brass didn’t even know much about what was driving the housing boom since the exotic mortgage based investments weren’t in existence while they were in the trenches themeselves. They relied on fast-talking traders and the risk models created by mathematicians from fundamentally flawed data sets, who all scattered like roaches under a flashlight when the collateral calls started pouring in. I don’t care how smart you think you are, allowing a company you run to get leveraged 30:1 on primarily CDO’s or synthetic CDO’s is pure insanity, no matter how liquid the market was for those products in 2005. One of the mistakes I made when I was younger was assuming most people who were in leadership positions were in them based on merit, and that a high level of reliance and trust could be placed on their decision making abilities. Now I realize that there are many, many undeserving individuals in business & politics who are currently deciding the fate of our country. Most of the “types” about whom you replied, if they were stuck in quicksand, and if given the choice on who/what to assist, I’d assist the quicksand. Becareful, that you do not get stuck in quicksand with them. These guys and their boards feel they are worthy of insanely rich compensation packages for supposedly being able to see around corners and walk on water. I would not think a little quicksand should be much of a problem for them. This would be especially true if former Merrill Lynch CEO John Thain (nickname Superman) was in their midst. You know, he was the guy with the million dollar bathroom and $35K shitter, and was previously CEO of the NY Stock Exchange prior to joining M&L while receiving a $15M signing bonus. He then ran them into the ground in about two years concluding with a sale of ML to Bank of America. On the other hand, if quicksand proves too much to overcome, Oh Well, no loss to humanity, IMHO. Maybe the world would actually be a little better off without them. and, my apologies for misspelling Jamie Dimon (Dimond). It must have been a Freudean slip. The only missing on that guy is a diamond imbedded in one of his finely capped teeth, that flashes and sparkles when he smiles and speaks to Congress. WM – my local bank, which has been “serving the local community” for oh, I’d say about a 100 years (20 of which I’ve been a part of) just sold out to a big banking “franchise” in Idaho. 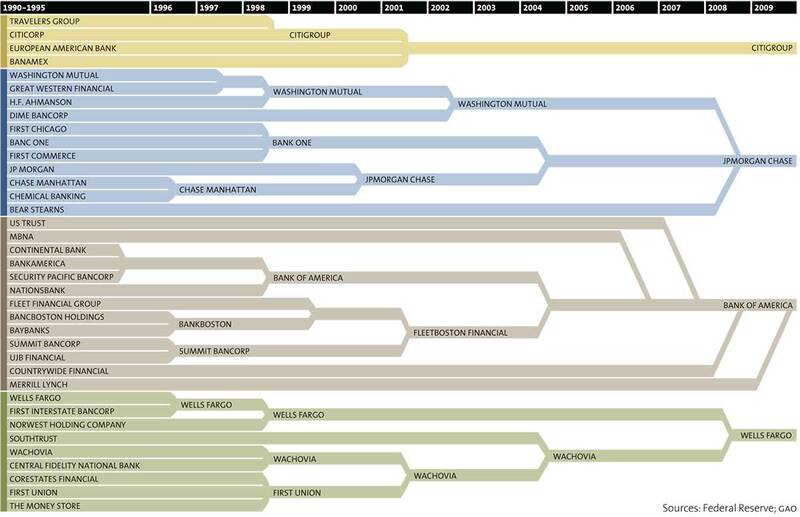 This graphic might be useful if you are discussing the current landscape of the American banking system. It shows that in 1990 there were 38 ” large” banks in the USA. Today , there are four… the ” too big to fail ” Wall Street chamber quartet, after recent ” adjustments ” in which another species of grizzly bear went extinct, that being Bear Stearns. Those four are the result of conglomeration, consolidation , hostile takeover, merger & acquisition or whatever else you want to call the ” Big Fish eat the Little Fish ” financial ecosystem. Of course this does not show the many smaller banking franchises, but would like to note that my town of Cody WY , population 10,000 is significantly ” overbanked” having five major banks plus a savings and loan that is also a bank. Those five banks are all owned by out of state holding companies or globals. Only the S&L is ” local” , serving in a 5 county customer area. Funny thing that back when I was young, ALL the banks were locally capitalized and owned and lended out a lot of money, back when the American Dream was real, not a nightmare. That cannot be a coincidence. Pretty soon we will have only three major airlines, three wireless carriers, a handful of freightline railroads, and so forth as the corporations feed on each other. Not that any of this has any direct bearing on wildlife and conservation issues— except it does to the extent that our own personal lives and even property have all been converted to an organic bank account and are all being merged and consolidated and gobbled up by the corporations at every plane , juncture, and boundary line in our modern existence. Politics and Finance are now joined at the hip , and insatiable. Fair thee well Titanic, fair thee well. A very interesting read. Betwixt the Arizona gun laws, NRA, and the usual government pedantic pace, it was a no win situation. They were buried by the law that if a gun is not used for a crime, there is no law broken. It’s been a while since I purchased a firearm. Is it true that there is no national data base on serial numbers, purchasers and sellers of firearms? I don’t know the answer to that question Immer. Use to have a small handgun and a 20 gauge shotgun, bought both guns from friends who insisted that it was a good idea to have the “protection” Finally sold them because I didn’t like having them around the cabin. IM, Based on the way the laws are wrote now a days, No, there is no National Database. If you are an FFL holder, you will be tracked at times, if you are an individual purchaser of a firearm, then no, there is no database. By the way, I am a FFL holder. Yep, totally agree with that comment CC.